Just one more review telling you to play this game. Sin & Punishment is no secret anymore; the launch of the US sequel (Star Successor) generated rave reviews from critics and fans alike. I just wanted to add my voice to the chorus of praise. Shooters, especially ones that hearken back to arcade-style bullet hell onslaughts, are familiar to almost any gamer of a certain age. I’ve ignored the genre for years, probably because I grew up in an era when spaceship shooters like Defender, Gradius, Lifeforce, Xevious, and their countless identical siblings were an overwrought (even tedious) format cramming every corner arcade and home system. If the reviews for Star Successor had been any less glowing or universal, I’d probably have missed it. You may be wondering why I’m mentioning high-octane space shooters in a review of a game that utilizes on-screen humanoid avatars and a behind-the-back camera angle. Star Successor looks nothing like the games I’ve mentioned, and to be perfectly technical, I should probably refer to it as a “bullet-hell rails shooter” (whatever THAT means). Whatever label we put on it, I can’t help but feel that the side-scrolling galactic adventures of the old days share a lot of common ground with the truly unique experience of Sin and Punishment….except that Star Successor grabs the volume knob, turns it up to eleven, and headbangs like a methed-out teenager. SS doesn’t fall squarely in any category, but instead combines a wildly entertaining mix of different ideas and styles. First in the mix, players are thrown head-first into a bullet-dodging shooter that never pauses for breath. All the best parts of the genre are here: an insane amount of incoming fire, score-multiplying for successive enemy hits, and screen-dwarfing boss fights that leave you clutching the controller in a dead-man’s grip (really, I get white knuckles!). But rather than sticking to a conventional top-down or side-scrolling perspective, SS utilizes a third-person on-rails viewpoint (aka ‘rails shooter’) and throws a cascade of stunning visuals straight at the player’s head…again, and again, and again. 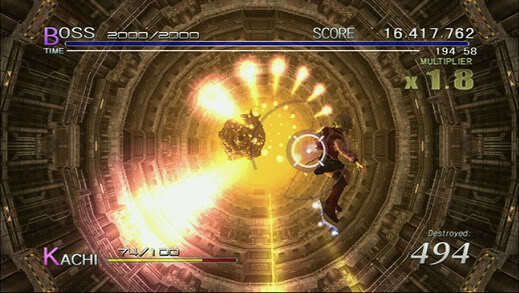 The key word here is hyperactive: unlike many on-rail games (such as the plodding pace of Resident Evil Umbrella Chronicles, or the methodical progress of COD), the camera wheels wildly, pirouetting and turning every few seconds, constantly forcing the player to recalculate potential targets or approaching threats. The blistering pace leaves virtually no time to marvel at the sheer awesomeness of the above-average graphics–but make no mistake, this game ranks near the top of the pile of all Wii titles. Thus, the basic components of a bullet-hell game are spun into something far more entertaining–you’re never allowed to get too comfortable with one mode of attack, yet you never feel restricted by a computer-controlled camera. One moment top down, next moment 45-degree isometric, next moment from below the character’s feet, you’ll be sweating bullets just trying to know which side is up (did I mention you’ll occasionally need to fight upside-down?). And since SS is focused on protagonists who can fly, the programers were able to cram the entire game with dizzying, gravity-defying visual effects that could only occur in a fantastical flight simulation. You’ll be bowled over by the game’s sheer visual excellence and the reckless joy of a game that rockets through the sky with no regard for earthbound physics, onscreen sprite counts, or ammunition limits. 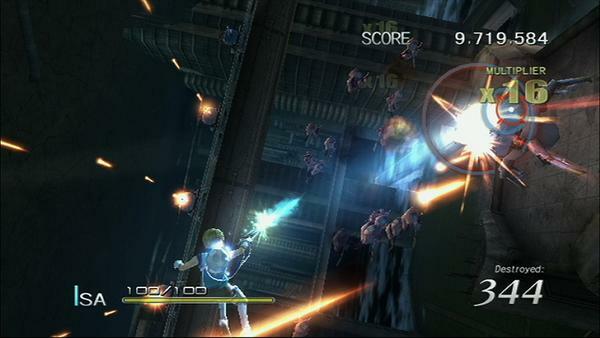 The main character, Isa, can move anywhere on the screen (behaving much like a player’s spaceship in the shooters of yore), or can land to hack and slash as needed. Dodging is an integral part of the action; whether in flight or on the ground, Isa can perform a rolling escape that provides a split-second of invulnerability. And though dodging lets Isa avoid damage, the angle and timing of your escapes must be used with pinpoint accuracy, the goal being to dodge through tiny holes in the endless barrage of missiles, machines, and the occasional gross tentacle. Thankfully, character control is highly responsive and genuinely entertaining. This might be the make-it-or-break-it aspect of Star Successor–once a player has mastered the controls, you realize you can (with practice) achieve the precision you’ll need to survive the onslaught. This is where the fun really begins; learning to zip and dodge around the screen is pleasing, fluid, and addictive. Great games often have that x-factor (try to explain why Super Mario Brothers is so purely fulfilling, even when you’re just busting blocks) and SS manages to capture that ineffable aspect of a good title–a really great control mechanism that hits all the right notes and is rewarding in itself. Flying around the screen, dodging and blasting baddies, giant explosions, crazy enemies and stupid, over-the-top plots…isn’t this why we got into games in the first place? Try blasting something, it's fun! During the process of writing this entry, I finished the game on normal difficulty, and have been revisiting some of the earlier levels to see if I can get some decent scores onto the online leaderboards (hell yeah, 414th highest score for level 2 on the USA local boards!) Overall, the difficulty is an interesting topic; checkpoints are frequent enough that you’ll rarely need more than a handful of attempts to pass most areas (some bosses are an exception to this rule) but the real challenge seems to be in completing whole levels while ratcheting up the all-important score multiplier. Get hit by an enemy (even once), and the multiplier plummets. Get through each barrage with minimal damage, and your score starts to go through the roof. This isnt to say the game isnt hard–it is. But since the player can set the difficulty (easy, medium or hard), I think SS is designed to be accessible to even entry-level players who might find the visually-overwhelming style to be a challenge in itself. You just won’t be finishing levels with a respectable score or all the hidden bonuses. And then you’ll find yourself itching to replay a level. Just one more time, and I can get a better score. Positively itching….i’ll be right back. I haven’t had a chance to try the game with the two-player co-op mode, but I’m really looking forward to it. Perhaps I’ll update this entry once I’ve had the pleasure. Stay tuned. Developer Treasure was clearly aiming to replicate the boisterous, explosive visuals of a golden-age arcade title, and perhaps this is why I love it so much. Star Successor is an unapologetic testosterone-filled shooter that fell through a timewarp from the heyday of upright machines. Here’s to a third sequel for Wii U or 3DS–I’ll be waiting.